In stock -This product will ship today if ordered within the next 11 hours and 7 minutes. 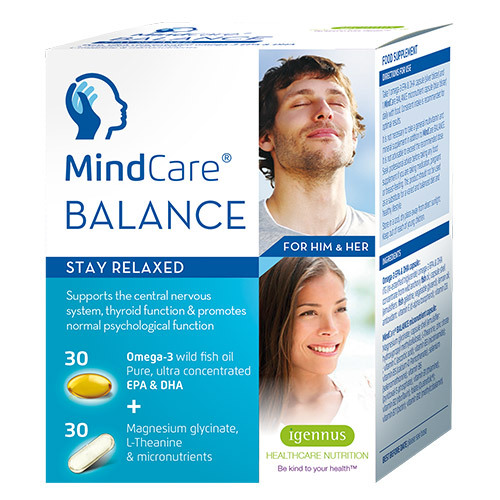 MindCare® Balance is an advanced nutrition supplement formulated to help people with busy and demanding lifestyles stay relaxed and keep on top of life. Targeted dual capsules provide key nutrients proven to support the central nervous system and promote thyroid and normal psychological function. This specialised formulation brings together pure, ultra concentrated omega-3 EPA & DHA, magnesium glycinate, L-Theanine and essential micronutrients. 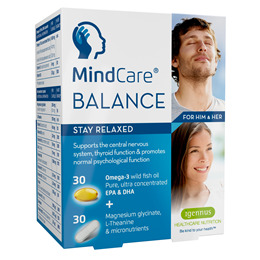 Chosen for their synergistic benefits, the ingredients in MindCare® Balance offer unprecedented bioavailability for brain and central nervous system support. Magnesium glycinate; capsule shell (emulsifier: hydroxypropyl methylcellulose); L-Theanine; zinc citrate; vitamin C (ascorbic acid); vitamin B3 (nicotinamide); vitamin B5 (calcium-D Pantothenate); selenium (selenomethionine); vitamin B6 (pyridoxal-5-phosphate); vitamin B1 (thiamine); vitamin B2 (riboflavin); folate (Quatrefolic®); vitamin B7 (biotin); vitamin B12 (methylcobalamin). Take 1 omega-3 EPA & DHA capsule (silver blister) and 1 MindCare Balance micronutrient capsule (blue blister) daily with food. Consistent intake is recommended for optimal results. It is not advisable to exceed the recommended dose. Seek professional advice before taking any food supplement if you are taking medication, pregnant or breast-feeding. Below are reviews of Igennus MindCare Balance - 30+30 Capsules by bodykind customers. If you have tried this product we'd love to hear what you think so please leave a review.